CARMEL, Ind. -- The mother and father of a dying 9-year-old boy stricken with muscular dystrophy are battling Carmel Clay Schools, hoping to make the last months of the boy's life as normal as possible. Greg and Susie Cowen said the school system is making a difficult situation worse by not allowing Jake Cowen's mother to accompany him to class, 6News' Joanna Massee reported. 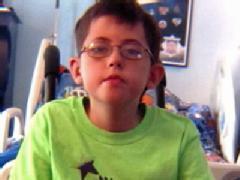 Jake's doctor expects the boy to live nine months. Aside from MD, the fourth-grader is also afflicted with autism. Jake needs either a nurse or his mother to help him, but Susie isn't permitted inside Mohawk Trails Elementary School. "They've said that I'm not allowed to go in and tend to his medical needs," Susie Cowen said. "We want Jacob to go to school because he loves attending school." Principal Linda Wilson declined an on-camera interview, but told Massee that the school accommodates the needs of children with medical issues. Jake's parents said they don't trust school employees after an incident in which they claimed a teacher nearly pulled feeding tubes the boy requires out because she thought it was a backpack instead of a feeding apparatus. "It feels like they're trying to bully us out," Greg Cowen said. Steve Dillon, director of student services at Carmel Clay, denied Cowen's accusation. "The school system would never push out a student that has medical needs simply because of their medical needs," Dillon said. Attorneys Catherine Michael and Ron Frazier are working with the Cowen family to fight the school and the clock. "We hope that the school district is going to realize the gravity of this situation and take immediate action to correct it," Michael said. "He could actually have fatal results as a result of the administrators and the teachers not fully understanding his medical fragility," Frazier said. Jake is now being kept at home. His parents requested a hearing before the Department of Education. Part of the request includes that Jake's mother be allowed to accompany the boy to school when his nurse isn't available.